It may seem surprising, but I don't care much for haunted attractions. They're great in theory, but I'm a big ol' wuss when it comes to actually visiting one. It's incongruous, I know, but there's just something too tangible about the scares in a haunted attraction. I need my scares once removed by way of a video presentation so I can deal with the horror intellectually. I once literally ran screaming from a haunted attraction in Virginia Beach and then out into the traffic in the street beyond. Even so, every Pre'Ween celebration demands at least one trip to a live haunt. When the day grows short and the air grows chilly, my inner child - wuss though he may be - craves it. Fortunately, I have Harrisonburg's Fear Forest just a few miles away each and every October. 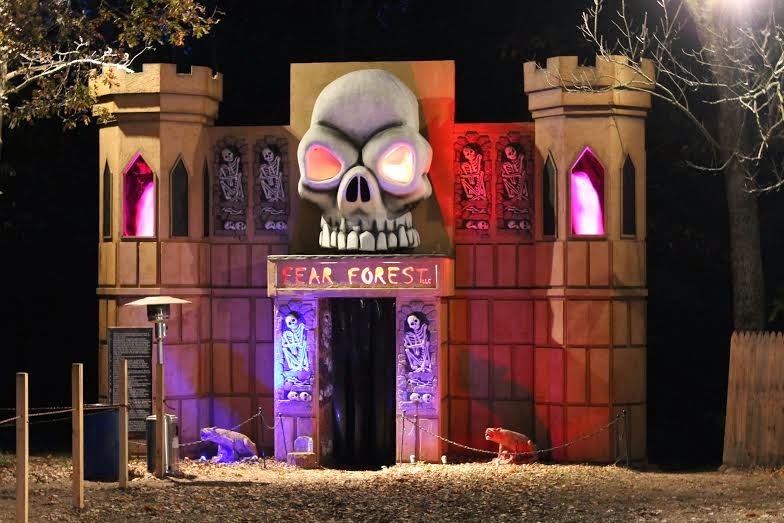 Fear Forest - where they say only the trees can hear you scream - is a spooky trek nearly half a mile long through haunted woodland dotted with thrills, chills, live performers, and ghoulish attractions every step of the way. There's just something irresistible about walking a dark woodland path by moonlight as the screams of others echo through the trees. Plenty of other haunted attractions operate nearby here in Virginia, but Fear Forest has earned my allegiance. I'm sure it helps that it's outdoors, and I can always run screaming without the need to dodge oncoming traffic. I'll also be taking my first trip through Fear Forest's second attraction this year, an interactive zombie laser showdown called the Fear Crops Zombie Harvest. 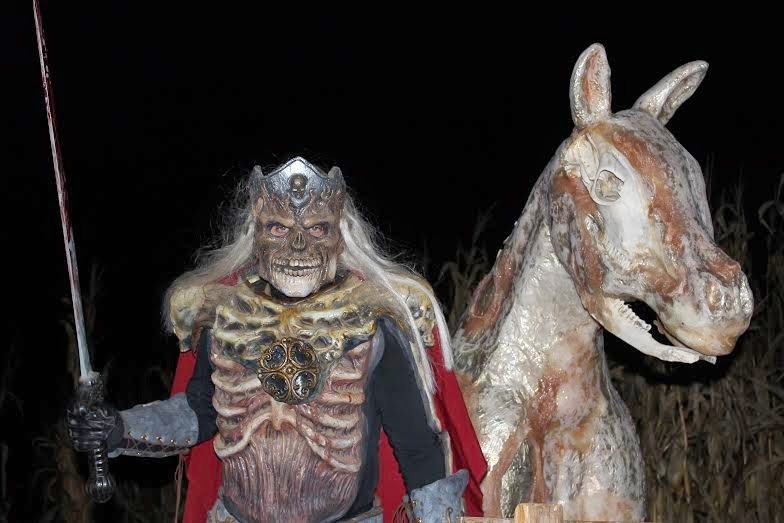 It's an interactive haunted hay wagon ride through a cornfield crawling with the undead. This isn't just target practice, tough. These zombie gunslingers are shooting back! 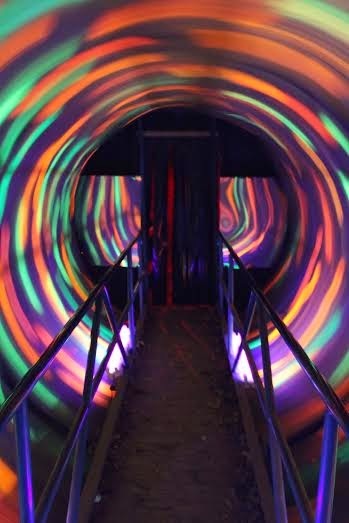 Fear Forest is open to the public beginning Friday, October 3rd. You can check the Fear Forest website for complete details. Admission is $12.00 per person per attraction, or $17.00 per person for admission to both attractions. If you can't stand spending too much time dreading the horrors that await, you can opt for a Fast Pass Admission to both attractions for only $27.00. How did Fear Forest come into being, and was its creation initially your brainchild? Fear Forest actually started as an ATV trail. My husband Chad Nesselrodt, a few friends, and myself sometimes would ride the trail at night followed by a campfire in the field. One night Chad and I were talking about how spooky it was in the dark...and that's where Fear Forest was first imagined. We were actors in a haunted cornfield attraction when we were younger, so we thought it would be a fun idea we could do together. We never imagined that we would still be going bigger and better nine years later. How many volunteers do you typically get for the Fright Crew? 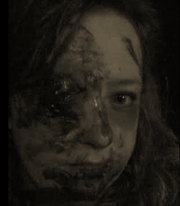 We have two attractions at Fear Forest - the haunted woods trail and Fear Crops Zombie Harvest. The haunted woods trail usually is occupied by forty-five to fifty "monsters" a night. Fear Crops is a laser tag attraction where the attendees get to shoot twenty or more of our walking dead. Then there is ticket staff, tractor drivers, tech support members, and security. That adds up to a full staff list of about eighty people a night to make our show operate. Our volunteers do receive a cash bonus for participation at the end of the season. Have any of your volunteers every been a little too into it? We've been very fortunate that most of our Fright Crew love to scare, and have what it takes. I would say more volunteers join thinking it is going to be easy and a lot of fun. The exact opposite is true! Haunting is hard work, and it takes a special person to do it. They have to be level-headed, willing to try different techniques, and not afraid to put themselves out there. Have you ever had an idea for the event that you ultimately decided was too intense or inappropriate for the general public? My mom actually monitors some of my ideas! "Nothing to do with babies, religion, or devil worshipping!" We do have church and youth group organizations that attend. We want to keep our show on the verge of extreme, but refrain from being offensive. I think that is why it is so well-perceived. It's like the good old scary movies I grew up on, intense startles without having to be graphic or...(laughs) I don't even know what to call some scary movies these days! How many visitors did Fear Forest host last year? Weather is a big factor in our attendance. Weekend nights we could have between eight hundred to a thousand attendees, while weeknights average four hundred to seven hundred attendees. What was the origin of your second attraction, Fear Crops? Zombies are a big thing right now. We attend a trade show for haunted attractions every year. Zombie paintball was a new thing that some vendors were promoting. But considering how cold it gets here in Virginia in October, we felt none of our zombies were going to want to get pelted by over a thousand frozen paint balls a night. So we took what we saw and altered the idea to suit what we wanted to offer our customers. We switched it up to laser guns, and we thought it would be cool if our zombies got to shoot back! Also, we made it a ride on old transformed ensilage wagons. It's sort of like a safari, but the wagons suit our theme much better. 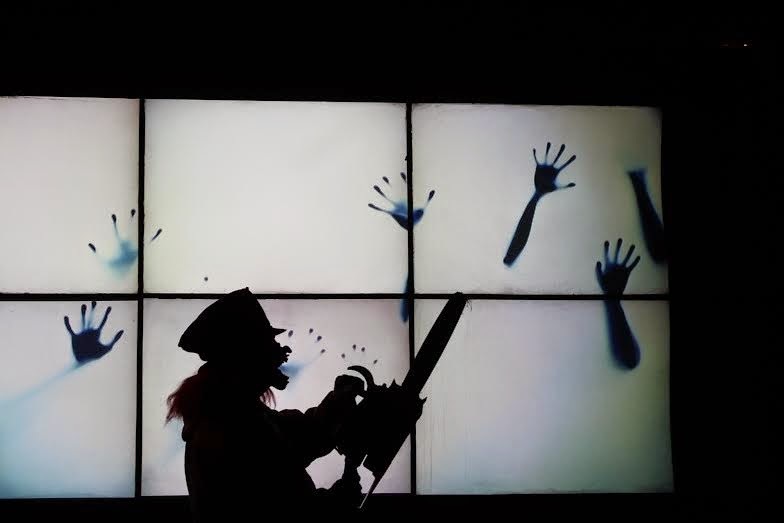 What new and exciting additions can visitors expect to see this year at Fear Forest/Fear Crops? This year we've added several new scenes to Fear Forest, and we've switched some of our more popular scenes. We have added some pneumatic props this year and some awesome visual effects our attendees have never seen at Fear Forest. There's more detail and a lot of hard effort. I think after nine years our guests will be pleasantly surprised by what is waiting for them. We've also made the trail a little more tolerable for those who had a phobia of exercise. At four-tenths of a mile, a steep climb in the middle wasn't the brightest decision in our initial trail plan. Now the path gently follows a less strenuous curve. 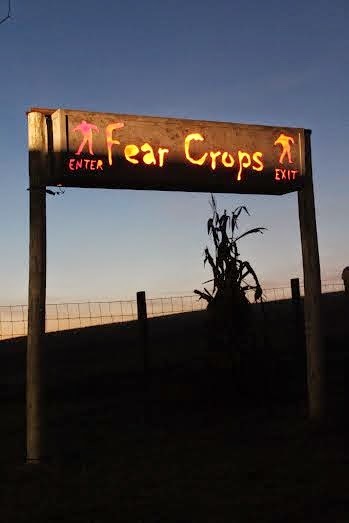 We are hoping to continue to build an audience for Fear Crops this year. The western theme continues there this year. But what's more fun than an old country shoot out? I have to assume you probably like scary movies. What are a few of your favorites, and why? I'm really into the horror I grew up on! Carrie, Friday The 13th, Halloween, The Texas Chainsaw Massacre, and Fright Night - the ORIGINALS, of course! There was something about those horror movies I loved when I was a kid that makes them my favorites still today. In what is an almost unheard of circumstance, I find myself posting twice in the same day. Pre'Ween just makes everything craaazy! Carl at The Info Zombie was kind enough to invite me back for my second guest shot on The Info Zombie Podcast for episode #84. Check it out, because he may not make the same error in judgement a third time. You can listen to the episode below or by downloading The Info Zombie Podcast #84 on iTunes. Be sure to subscribe to Carl's podcast while you're visiting iTunes, and check out The Info Zombie website, as well. I also wanted to take a moment to welcome Carl and all the other bloggers helping the Dog Farm celebrate Pre'Ween this year. Following is a list of participants already on the roster, with hopefully even more to be added later. I encourage everyone to visit each of these fine websites, and you can stop by here at the Dog Farm for updates on all of the most recent posts, as well. Just click any of the Pre'Ween 2014 graphics that currently litter the site for all of the latest! This month's Movies At Dog Farm Virtual Drive-In is scheduled for Saturday, October 4th at 9:30 pm Eastern Standard. We'll be watching Invasion Of The Bee Girls (1973). Yeah, that's right... Invasion Of The Bee Girls. If you're interested in joining us - and I know you are - click here for details. My dilemma with haunted attractions is that I want to stop and notice all the details that went into making the scene. Unfortunately, the nature of the sites revolve around herding the people through as fast as possible so as to maximize profit. Yeah, I am the guy at Halloween Horror Nights stopping and pointing while saying "Cool!" while all around me are shrieking in terror. Fear Forest's concept of being imbedded in an actual forest is cool as hell. That would be a chilling atmosphere, particularly on a cold night. Again, you make me jealous with your geographic region. Fear Forest is pretty great. You'd be stopping and pointing, and I'd be the chickenshit trying to get past you to the exit. I do better with that than the claustrophobia brought on by tight indoor spaces and crowds, though. By the way, sorry about not having the mic plugged in for the podcast. And I was so proud of myself for having spoken more quietly... That's my bad folks, not Carl's. It's still a fun listen if you can get past the fact that I'm more unintelligible than usual. Some would say that makes it even better! Great podcast! I was glad to hear so much discussion of The Sentinel. I'm glad you could dope out what I was saying. The Sentinel is apparently a little more appreciated than I thought it was. My post on it from back in the spring still pulls more viewers than a lot of newer content. That would be fun. I was hesitant to get into podcasting because of my accent but it turns out it's so much fun I don't care. Like that they watch the content. Mom monitoring the ideas probably helps! If I lived closer, I'd check it out. It is hard to do a good Halloween attraction. Supposed to be one near Greensboro, NC that is one of the top in the nation, but we've never hit the road to check it out. Saw your comment at Jessica Bell's site (I'm a good friend of Jeremy's) about not getting a lot of traffic here and thought I'd stop by and see what your site was all about! Thanks for visiting, Alex. All are welcome. Alex writes science fiction, folks. Check out alexjcavanaugh.blogspot.com for more details!